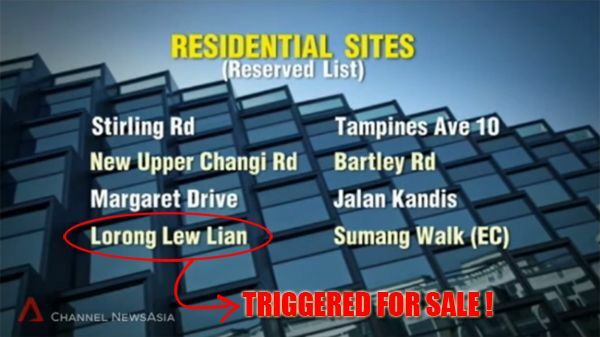 According to the Urban Redevelopment Authority (URA) of Singapore, the site at Lorong Lew Lian, which was one of the plots on the reserve list under the Government Land Sales (GLS) programme has been triggered for sale due to a minimum bid received (S$250 million or S$552.90 per sq ft per plot ratio (psf ppr) ) from an anonymous developer. The tender for this land plot is expected to launch in October 2015 (no official date announced yet) and will be opened for bidding within a period of 4 to 6 weeks. The 99-year leasehold site, with a vast area of approximately 1.4 hectares and a plot ratio of 3.0, is situated near to the Serangoon MRT Station/Interchange and NEX mega shopping mall. Based on the 2H2015 GLS Programme estimates, this land plot could potentially yield up to approximately 465 private residential homes. It was noted in reports that some property experts and market analysts were startled that a plot under the reserve list has been triggered despite current situations where soft demand has been seen recently in the private residential property market. And also, this trigger for release is the first time in approximately 21 months. The research head of Savills Singapore, Mr Alan Cheong reckons that this new launch condo could possibly fetch at an higher average of S$1,400 psf, given it’s proximity to Serangoon MRT Interchange Station. Thus the bids should come in aggressively between the range of S$700 to S$800 psf. He has also pointed out Cheung Kong’s winning bid of S$849 psf ppr for the mixed development site near Kovan MRT Station in 2014 and UOL Group’s winning bid of S$648 psf ppr in January 2014 for the current site of Botanique at Bartley, as potential references to the upcoming tender for the plot at Lorong Lew Lian.